MAY 2008 -- “Summertime and the living is easy.” So goes the words of a song. We could substitute one about the Grange that says “Summertime and the Grange gets more relaxed.” This is when we have picnics often adding a “meeting” to cover any business. This could be a good time to invite people you fell might decide to become members. In April, Totoket Grange gave membership awards to Carlton Platt for 75 years and Elmer Russell for 60 years. There were many visiting Grangers and some non-Grangers as well. During refreshments, one of our officers introduced her mother to me. She later told me that her mother would like to join our Grange. That is being followed up on. A member does not need to be a relative. It can be a friend, a neighbor, someone with whom you work. Will everyone jump at the opportunity? No, but some will. As Grange is noted as a secret society by many, they may think they have to be invited so they wait to be asked. It is also wise to maintain a good relationship with your local newspapers. 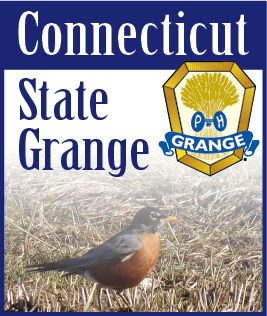 This gives the public the opportunity to know more about your Grange and get them interested. We are not going to get huge numbers of members but we can attract the people that will make good Grangers. We have to reach out.